This case study is a little unique. This case study will not be focused on clinical challenges, but rather, it will be focused on our 360 degree approach to discharges: Patient, Family, Staff. Mary Johnson, 74-year-old female, and Isabelle Schekira, 75-year-old female, were admitted in late 2015. Both women came to Emerald Peek with diagnoses of disorientation and dementia, without behavioral disturbances. Mary and Isabelle were initially high fall risks and high elopement risks and non-compliant with their treatment and care plans. They were ambulatory with limited assistance of one and fully independent with hygiene and bed mobility. The interdisciplinary team agreed that both women had the ability to participate in rehab and safely discharge to an assisted living community. The challenge for this team was to show Mary, Isabelle and their families those abilities. The women and their families did not think it was possible. 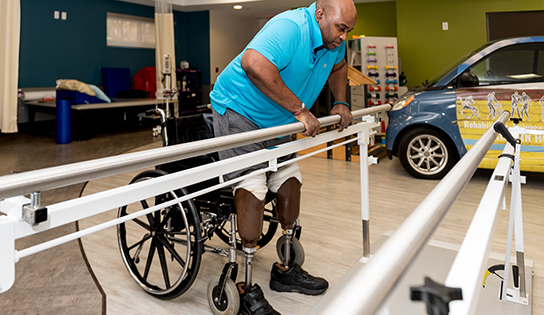 The rehabilitation team focused on one area: ambulation. The team, including Julie, Physical Therapist, and Tosin, Occupational Therapist, quickly introduced differing scenarios for ambulation. The scenarios included stairs, uneven surfaces, longer distances, and frequent therapies. For example, most ambulation therapies would be once in the morning and once in the evening. The rehabilitation team had Mary and Isabelle ambulate three to four times a day, building lower body strength and stamina. This proved very valuable, as both women began to ambulate with a walker within months. The Admissions and Therapeutic Recreation team focused on one area: social engagement. The women suffer from depression, so the teams knew that social engagement would be vital to a successful discharge. Mary and Isabelle were strategically placed with roommates who would be good partners in engaging these women. These roommates were in the same age group, with similar hobbies and passions. The pairings were successful. Therapeutic Recreation, under Katie Foulk’s leadership, worked with Mary and Isabelle to find programming that would continue to assist with the development of social engagement. Isabelle is an avid card player, so Katie implemented group card playing events to engage Isabelle. Mary loved reading and movies, so Katie ensured Mary had a voice in the movies chosen for the community and presented Mary with books she loved. Throughout rehabilitation, Mary and Isabelle became fixtures here at Emerald Peek. They grew to trust and believe in us, as we did in them. Their families did as well. This dynamic became challenging as we worked toward discharge. Both women did not want to go. They felt comfortable here at Emerald Peek and did not understand why a discharge to a higher functioning community would be important or necessary. The team, however, knew that discharge was the best plan for both women. In order to make Mary and Isabelle feel more comfortable, the Social Worker, Susan, planned visits to two assisted living communities in the local area. Although the women enjoyed the visit, they were still very hesitant to discharge away from Emerald Peek. Our Social Worker had a different idea: what if we looked at a group home rather than assisted living? It would give both women an opportunity to broaden their social horizons and give them more freedom to get out and shop, go to movies, dinners and other social activities. We met with a couple of group homes and found one that was a perfect fit. The residents at the group home were in the same age group, cognitive ability and planned frequent outings into the community. The women and their families were still not convinced. In this moment, having an RN Care Manager makes all the difference. Sandy, our RN Care Manager, planned weekly visits with the women to make sure they would settle in their new community and the services offered were the services rendered. The families and women felt more comfortable and agreed to the discharge. One week after discharge, Katie Cullum, Director of Concierge Services and Sandy facilitated Facetime between Isabelle and her former roommate here at Emerald Peek, which helped Isabelle know we were never too far away.